"one of the best workshops I've attended in years." We use the Appreciative Way as the foundation for our year-long Certificate in Appreciative Transitional Ministry training. We are approved sponsors of Continuing Education for Psychologists, Professional Counselors, and Coaches. Gain an in-depth understanding of Appreciative Inquiry. 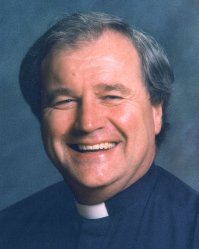 Conduct an appreciative inquiry into your vocation and mission. Learn appreciative ways of creating change and transformation. Learn how to be an appreciative presence in the world. No Introduction to Appreciative Inquiry workshops are scheduled at this time. This is our foundational appreciative inquiry program that introduces people not only to Appreciative Inquiry but also to the Appreciative Way. All of our other programs are built on the philosophy and practice of appreciative inquiry. Rob Voyle, Psy.D. Director of the Appreciative Way and Clergy Leadership Institute. Rob is an international leader in the use of Appreciative Inquiry in Church settings and Executive and Personal Coaching. The change work of Milton Erickson, MD. and his students. Contemplative Spirituality as distinct from religion and how spirituality can be used as an agent of transformation. This synthesis which we call the Appreciative Way, a way of seeing, being and doing in the world. Implement an Appreciative Inquiry process with themselves, others, congregations and organizations, to enable innovative, creative personal and organizational change. Identifying appreciative processes in contrast to problem or pathology driven models of intervention and to use these appreciative processes to enhance personal and organizational effectiveness. This program qualifies for 16 hours of continuing education credit. Partial continuing education credit is not provided. You must attend all 16 hours to receive continuing education credit. The Appreciative Way is approved by the American Psychological Association to sponsor continuing education for psychologists. The Appreciative Way maintains responsibility for this program and its content. This program qualifies for 16 hours of continuing education credit. No pre-reading or backgound in Appreciative Inquiry is required for this program. You will be provided an extensive 70 page handout and folder and participants will be able to access additional online resources after the completion of the program. 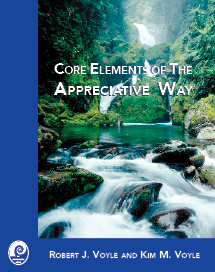 Core Elements of the Appreciative Way by Rob and Kim Voyle which is available at our Bookstore. For those interested more specifically in Organizational Development written for the secular world we recommend Change at the Speed of Imagination by Watkins and Mohr. It is available at most major book stores. In addition to the above 2.5 day program we occasionally offer a 3 and 4 day programs which includes opportunity for participants to create specific interventions or programs based on appreciative inquiry theory. Prices will depend on the nature of the program. Rob's appreciative coach training helped me to rethink the way I approach and provide therapy; Thanks!